استادیار گروه اقتصاد کشاورزی، دانشکده علوم کشاورزی، دانشگاه گیلان. ایران بزرگ‌ترین تولیدکننده و صادرکننده زعفران در سطح جهان محسوب می‌شود. با توجه به جایگاه این محصول در سبد صادرات غیرنفتی ایران، تدوین راهبرد مناسب صادرات و ثبات درآمد ارزی کشور با تمرکز فعالیت‌های بازاریابی در بازارهای هدف برخوردار از اولویت بالا ضرورتی انکارناپذیر است. پژوهش حاضر به‌منظور اولویت‌بندی بازارهای هدف صادرات انواع زعفران بسته‌بندی شده ایران بر مبنای داده‌های سال‌های 91-1389 صورت گرفت. 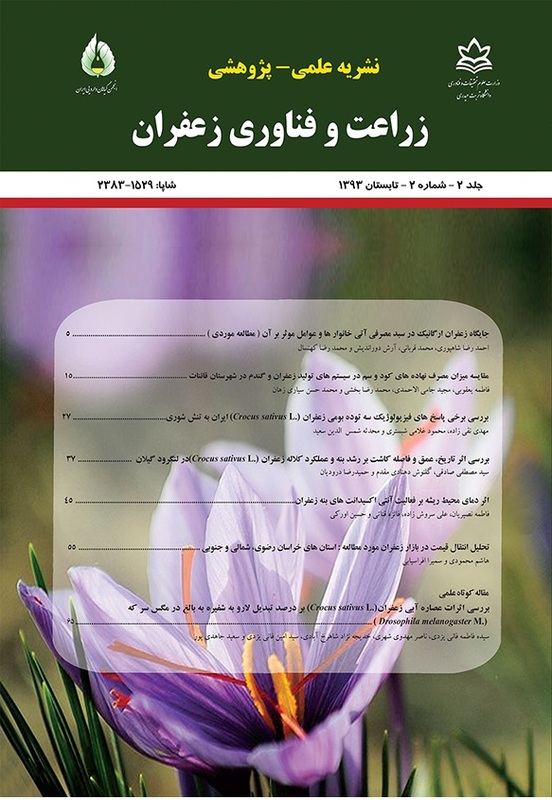 در این راستا، سه رهیافت تاکسونومی عددی، TOPSIS و غربال‌گیری وزنی به کار گرفته شد. نتایج حاصل نشان داد که اولویت‌های نخست صادرات برای انواع پودر زعفران در بسته‌بندی 10 تا 30 گرم (کد تعرفه 09102014) شامل اسپانیا، امارات متحده عربی و ایتالیا، برای زعفران در بسته‌بندی کمتر از 10 گرم (کد تعرفه 09102011) شامل عربستان سعودی و اسپانیا، و برای زعفران در بسته‌بندی 10 تا 30 گرم (کد تعرفه 09102013) شامل امارات متحده عربی، اسپانیا و عربستان سعودی می‌باشند. با توجه به ویژگی و ساختار سه رهیافت مورد استفاده، در اولویت‌بندی کلی بازارها به‌منظور صادرات انواع زعفران بسته‌بندی شده استفاده از نتایج روش غربال‌گیری وزنی و TOPSIS و در اولویت‌بندی بازارهای همگن (به لحاظ شاخص‌های مورد استفاده برای اولویت‌بندی)، کاربرد نتایج روش تاکسونومی عددی توصیه می‌شود. Assistant Professor, Department of Agricultural Economics, Faculty of Agricultural Sciences, University of Guilan. Considering the position of saffron in Iran's non-petroleum export basket, establishing proper export strategy through concentrating marketing activities in markets with high priority is inevitable. This study ranks export goal markets of different Iran's packaged saffron using annual data of 2010-2012. To this end, three approaches of numerical taxonomy, TOPSIS and weighted riddling were applied. Results revealed that priorities for exporting different saffron powder in 10 to 30 g packages include Spain, UAE and Italy, for saffron in less than 10 g packages these priorities include Saudi Arabia and Spain, for saffron in 10 to 30 g packages (tariff code 09102013) these priorities include UAE, Spain and Saudi Arabia. Numerical taxonomy approach showed that for different saffron powder in 10 to 30 g packages Saudi Arabia and Spain, saffron in less than 10 g packages Saudi Arabia and Spain, and for saffron in 10 to 30 g packages (tariff code 09102013) United Arab of Emirates, Spain and China are heterogeneous markets. Results of TOPSIS approach showed that for exporting different saffron powder in 10 to 30 g packages and saffron in less than 10 g packages Spain is the first priority and for saffron in 10 to 30 g packages (tariff code 09102013) United Arab of Emirates is the first priority. In weighted riddling approach according to the experts' viewpoints the weight of import demand index considered as 50% and the other indices weights equal 8.3%. Results of this approach revealed that for exporting different saffron powder in 10 to 30 g packages and saffron in less than 10 g packages Spain was the first priority. Also, for exporting saffron in 10 to 30 g packages (tariff code 09102013) United Arab of Emirates was the first priority. Based on these results, for ranking markets in order to export different packaged saffron, using weighted riddling and TOPSIS methods results and for ranking homogenous markets (considering used indices) applying numerical taxonomy results were advised. Abedin, M., and Asgari, M. 2005. Investigating comparative advantages and ranking export goal markets of Iran's Honey. Journal of Agricultural Economics and Development 50: 167-200. (In Persian with English Summery). Cannon, J.P., and Perreault, W.D. 1999. Buyer-Seller Relationship in Business Markets. Journal of Marketing Research 36: 439-460. Cavusgil, S.T., Kiyak, T., and Yeniyurt, S. 2004. Complementary approaches to preliminary foreign market opportunity assessment: country clustering and country ranking. Industrial Marketing Management 33: 607-617. Chen Tung, C. 2004. Extension of TOPSIS for group decision-making under fuzzy environment. Fuzzy Sets and Systems 156: 1-9. Chizari, A.H., and AbolhasaniYasori, S. 2011. Investigating comparative advantages and ranking export goal markets of Iran's Kiwi. Journal of Agricultural Economics and Development 76: 1-37. (In Persian with English Summery). Fahimifar, J., Valibeygi, H., and AbedinMaghanaki, M.R. 2004. Ranking Export Goal Markets of Selected Petroleum Products. Institute of Commerce Studies and Research. (In Persian with English Summery). Fathi, Y. 2002. Evaluating comparative advantages and ranking export goal markets of Iran's complement stones. Journal of Commerce Research 22: 123-154. (In Persian with English Summery). Hepu, D., Hsing, Y., and Willis, R.J. 2000. Intercompany comparison using modified TOPSIS with objective weight. Computer and Operation Research 27: 527-529. Hossieni, S.S., KavoosiKalashami, M., and Darijani, A. 2008. Investigating comparative advantages and ranking export goal markets of Iran's Caviar. Journal of Agricultural Sciences and Natural Resources 15: 1-8. (In Persian with English Summery). Jason, H. 2008. Do regional trade agreements increase members' agricultural trade? American Journal of Agricultural Economics 53: 96-111. Khaksar Astane, H., Mazhari, M., and Shahnooshi, N. 2007. Determining comparative advantages and identifying goal markets of Iran's hand-woven carpet. Goljam 11: 113-124. Kuppusamy, J., and Anantharaman, R.N. 2012. The link between export performance and export development: does managements' motivation play a role? Journal of Organizational Management Studies 1: 1-11. Miller, J.G., and Roth, A.V. 1994. Taxonomy of Manufacturing Strategies. Management Science 40: 285-304. Motefakerazad, M.A., Ghalebi, S., and Jahangiri, Kh. 2011. Investigating comparative advantages and ranking export goal markets of Iran's skin and leather industries. Journal of Economics Science 11: 149-168. Ramazanian, M.R., Moradi, M., and EisazadehSaravani, A. 2012. Ranking export goal markets of Iran's engineering and technical services. Journal of Economics and New Trade 29 & 30: 155-179. (In Persian with English Summery). The Islamic Republic of Iran Customs Administration. 2011. Time Series Data of Saffron Export. Available at web site http:// www.irica.gov.ir (verified 24 October 2013). Torkamani, D.P. 2011. Determining and ranking export goal markets of information and communication technologies related industries. Journal of Economics and New Trade, 25 & 26: 187-215. (In Persian with English Summery). Wong, F.C. and Peh, K.H. 2000. Growth in Singapore's export markets. Journal of International Trade 19: 353-367. World Bank Group (WB). 2013. The World Bank Database. Available at web site http:// www.WorldBank.org (verified 24 October 2013). World Trade Organization (WTO). 2013. The WTO Database. Available at web site http://www.WTO.org (verified 24 October 2013).